Three tourists have been injured by a shark in three separate attacks at the Egyptian resort of Sharm el-Sheikh. Virtually all water sports have been suspended at the Red Sea resort following the attacks. One of the tourists is believed to be in a critical condition in hospital in the Egyptian capital, Cairo. 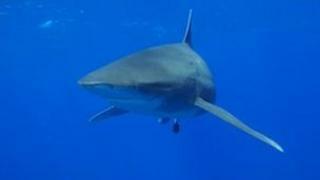 The authorities are searching for an oceanic white tip shark, which is believed to have carried out the attacks. They want to capture the shark and release it into the open sea. The Associated Press news agency quoted a local conservation official, Mohammed Salem, as saying all the victims were Russian. The suspension of diving and water sports applies to all but a small area around Sharm el-Sheikh. Attacks by oceanic white tip sharks are extremely rare and shark attacks of any kind are very unusual in the Red Sea. The BBC Cairo correspondent, Jon Leyne, says it is one of the most popular areas in the world for diving, so a decision to suspend water sports there would not have been taken lightly.